​The Ninth Circuit District Court of Appeals (federal), which affects Nevada, found that concealed carry is not a constitutionally protected right. At the moment, this does not affect Nevada as we have our own state 'shall issue' law and a state constitutional right to bear arms, but case law, which the court relied upon, found that concealed carry can be prohibited or regulated. However, Nevadans must be ever vigilant about maintaining their right to carry concealed, the Ninth Circuit notwithstanding. Johannes Paulsen wrote about the decision, stating that the justices missed the point about the argument being presented. 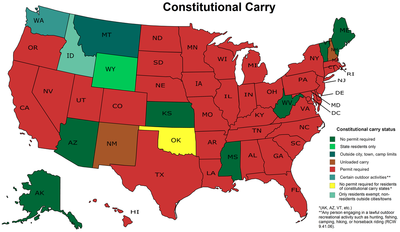 On June 9, 2016, the Ninth Circuit District Court of Appeals, which has jurisdiction over Nevada, ruled against concealed carry in the California case of Peruta v. Gore, essentially finding that concealed carry is not constitutionally protected, whereas open carry mightbe, however, the defendants didn’t ask about that. Interestingly, California banned open carry in 1967 when Gov. Reagan signed the Mulford Act because Black Panthers protested discrimination and police brutality while armed, most notably at the State Capitol. A similar reaction in Washington State failed. Unloaded open carry was banned in 2011 after activists began doing it and a legislator wet their pants seeing it in the news. The problem is that the 'may issue' criteria is so nebulous that in some counties, it is well-nigh impossible to get a permit. On its face, California law allows for 'good cause' issuance, but until the initial pro-gun ruling in Peruta, most counties in California refused to issue permits to anyone without special cause such as celebrities and friends of the sheriff/chief. This decision is not at all unexpected from the widely panned Ninth Circuit. However, conflicting rulings across the county now set this issue up for a Supreme Court constitutional challenge which could well mean the end of the right to bear arms or civil war. Now because open carry is illegal in California, the initial rulings in Peruta found that law enforcement had to conform to 'shall issue' like rules where self-defense and personal protection were considered to be 'good cause.' Some counties, like Fresno, Kern, and those in the far north of the state, issued permits on a virtual 'shall issue' basis before the ruling. This does not affect Nevada (at the moment) because we have a statutory 'shall issue' scheme in place since 1995. Nevada also allows unlicensed open carry, having long recognized, like many Western states, that open carry cannot be strictly regulated or prohibited. Of course, Nevadans must remain alert to Federal, US Supreme Court, or state-level efforts to further infringe upon the right to bear arms. Headlines are reading like a veritable death sentence for armed self-defense. Concealed carry supremacists are panicking and filming loud, angry YouTube videos denouncing the Ninth Circuit Court of Appeals, the Supreme Court, Hillary Clinton, and threatening to divorce California from the union. The headlines should be more along the lines of: "Court Finds Open Carry Constitutionally Protected, Concealed Carry Not." Many citizens have been confused by the lack of laws authorizing the open carry of firearms in Nevada law. A legal principle exists, codified as NRS 193.120, that states if something is not made illegal, that thing is legal to do. Therefore, no law prohibiting open carry means it is legal. In light of statues like NRS 202.3673, one might think that omitting open carry in light of banning concealed carry was an oversight. No, it was not. Open carry has long been protected on constitutional grounds while concealed carry has been repeatedly ruled against. The next thought is that in this modern age, someone would have surely banned open carry by now. 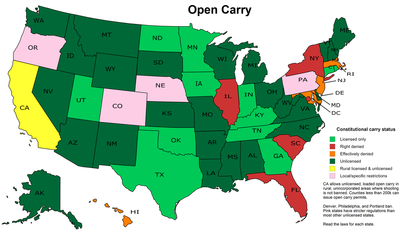 Actually, in most states, particularly in the Intermountain West, open carry is less regulated than concealed carry. Indeed, there is an unwritten understanding and a large body of case law that open carry is the constitutionally protected form of bearing arms, while concealed carry is not. Today, any armed citizen or rational, informed person would laugh at the idea of licensed concealed carrier being up to no good because their gun is under their coat. In fact, most armed citizens prefer concealed carry and so do most police and government officials. Studies have shown that concealed carriers are more law abiding than the general public—even police—and that crime rates have declined as concealed carry permits have increased. The old arguments that concealed carry is the providence of the scoundrel need to be put out to pasture. Concealed vs. open carry today is a matter of perspective. A little over a hundred years ago, concealed carry was “a pernicious practice,” when today prominent shooting instructors libel open carry as ‘suicidal’ or ‘showing off.’ So why did concealed carry go from demonized to preferred and how was open carry so forgotten about that what was once ordinary become the subject of national news? Because of the perception of increased safety, people stopped carrying firearms, stopped making them regular part of western life, and viewed them as a relic of a bygone, more barbaric age. I won’t digress into the psychological and cultural aspects of this, but studies have shown that in the last few years, American’s perception of guns has changed from bad to good. The reality is that the advancements through history only reduced the likelihood that one would need a gun to defend themselves; not that people became more law abiding or less likely to commit a crime. The preferred method of carry switched from open to concealed carry some in the mid-20th Century. Unfortunately, at the time of this writing not enough textual evidence has been gathered to document the switch. A survey of old gun advertisements and models will show that the true ‘pocket pistol’ began to become popular around the time of World War I and grew through the 1920s and ‘30s. This is based on a long-standing historical attitude, one that is no longer a current belief, that concealed carry was underhanded, unfair, and only something that criminals did. A multitude of court cases, some cited in the opinion, and examples from contemporary news, literature, and periodicals paint a hidden gun as something criminal. In 1791, when the Bill of Rights was adopted, the “prohibitions” on concealed carry were not on the carrying of concealed weapons but in their use. The 18th century courts had an easy three point test: (1) If one entered into an otherwise fair fight with the intent of using his concealed weapon and his opponent died then he was guilty of murder. (2) If one entered into an otherwise fair fight without the intent of using his concealed weapon and his opponent died then he was guilty of manslaughter. (3) If one were attacked while carrying a concealed weapon, say by a robber, and one drew his concealed weapon and killed the robber then no crime was committed. Under English common law, which was in effect when the Second Amendment was enacted, the use of a concealed weapon was a deciding element in whether or not a person was guilty of murder (in which case he was executed) or a person was guilty of manslaughter (which did not result in a death penalty and which was pardonable). In short, the Second Amendment never guaranteed the right to carry concealed with the possible exception for travelers while actually on a journey. Because it is the nature of criminals to carry concealed weapons and to use them for “secret advantage and unmanly assassination” states began to enact prohibitions on the carrying of concealed weapons but exempted travelers while they were on a journey. ​States have had various concealed carry laws on the books for much of the nation’s history. At this time, we will not go into an exhaustive level of detail; please refer to the Peruta opinion. Bans were challenged and rescinded. Nevada’s first concealed carry law dates from 1881 and applies to minors. Around the turn of the century, a general concealed carry ban, without permission from the county commissioners, was passed. The biggest wave of concealed carry bans began in the late 1910’s through the 1920’s. This coincided with “A Uniform Act to Regulate the Sale and Possession of Firearms,” ironically intended to stop the spread of New York’s Sullivan Act which practically outlawed handgun ownership in New York City and hindered in Upstate. As states passed laws regulating the sale of handguns, many additionally required a permit to carry a concealed firearm or banned it outright. ​The U.S. Supreme Court in Robertson v. Baldwin (1897) found: "[...] the right of the people to keep and bear arms (Art. II) is not infringed by laws prohibiting the carrying of concealed weapons [...]"
While it is undoubtedly within the power of the legislature to prohibit the carrying of concealed deadly weapons, and such regulation is a proper exercise of police power, yet the legislature does not possess the power to prohibit the carrying of firearms, as the right to do so is guaranteed to the citizen both by our federal and state constitutions. A statute prohibiting the carrying of concealed deadly weapons would be a proper exercise of the police power of the state. But the statute in question does not prohibit the carrying of weapons concealed, which is of itself a pernicious practice, but prohibits the carrying of them in any manner in cities, towns, and villages. ​Constitutional language allowing the regulation of concealed weapons was added to many state constitutions, beginning with Kentucky in 1875, after a case in that state from a 1813 statute when an anti-concealed carry statute was overturned as an unconstitutional restriction of the right to bear arms in 1822 (Bliss v. Commonwealth). I never in all my life found it necessary to carry a six shooter and I have passed through nearly all the scenes and experiences of this wild and unsettled country. Carrying arms is dangerous. It is a very dangerous thing to oneself and to one’s associates and should not be permitted under any circumstances. I have seen lives lost and innocent blood spilled just through the carrying of arms, concealed weapons, under one’s coat or shirt. It is most dangerous and vile, a practice that should never be permitted except in times of war and never in time of peace.Think of it: carrying a six shooter or a knife or some other terrible arm of defense, and then in a moment of heated passion using that weapon. I do not believe in it, and I move to strike out that section. The 1901 Penal Code of the Arizona Territory contained a broad restriction of concealed weapons. Although this may suggest that the framers intended that a regulation of concealed weapons be within the police power of the state as a reasonable regulation of the right to bear arms, it is far from conclusive. Carrying weapons was still common in 1910, and it may have been thought that no honest man had any reason to hide his sidearm. ​The lack of a constitutional challenge may be explained by the existence of a society more tolerant of openly wearing a pistol on one’s hip. It was only when the social stigma attached to gun ownership, and particularly gun carrying, grew to a sufficient degree that Arizona citizens were inspired to challenge it. ​Indeed, the majority’s lengthy historical analysis fails to appreciate that many of its cited cases either presumed a right to openly carry a firearm in public or relied on a pre-Heller interpretation of the Second Amendment. Furthermore, the majority of Nineteenth Century courts agreed that the Second Amendment right extended outside the home and included, at minimum, the right to carry an operable weapon in public for the purpose of lawful self-defense. Based on the overwhelming consensus of historical sources, we conclude that the protection of the Second Amendment — whatever the scope of that protection may be — simply does not extend to the carrying of concealed firearms in public by members of the general public. Now it is undisputable that concealed carry was historically and judicially disfavored while open carry was considered honest and forthright. As will be discussed below, these old notions, which the Ninth Circuit court conveniently upheld, are totally spurious. Editor's note: The purpose of this article is not to discussed the highly flaws arguments used by the court in the Peruta decision in regards to open carry. Please see the corresponding blog opinion article for ​more.